Hey Total Gym users! If you love your Total Gym, then you’re going to love one of the latest additions to the Total Gym family of home equipment: the Total Gym Row Trainer. Yeah, I’m a little weird, but I love my daily cardio exercise. Let me clarify. No, I’m not always gung-ho to do cardio exercise, but I’m addicted to all the benefits. My favorite benefit is the extra energy it provides me throughout the day. Cardio exercise doesn’t take time, it gives time! At the gym, I was good friends with every piece of cardio equipment because my overactive brain gets me bored quickly, so I need to mix it up. Also, “cross-training” (as it is referred) is a smart way for all of us to work out. It delivers better results for your entire body. However, there was one cardio piece I could never get down with: the rowing machine. I avoided it like the plague, and I always had trouble getting my heart rate up into my training zone, and my lower back would start to ache after about five minutes. Not to mention, I found it boring. The brilliant engineers at Total Gym have done it again! 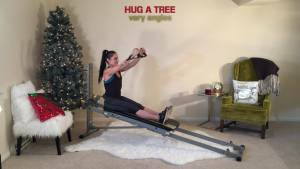 You have to try the Row Trainer to feel how smooth and natural it feels. Because the comfy, ergonomically designed seat is on an incline, your legs stay below your hips so it is easy to keep your spine nice and upright. Goodbye, lower back problems! The resistance is created by your body weight being pulled up the incline. The incline has two settings, 17% or 20% of your body weight, so you can increase or decrease difficulty according to your desired effort level. In addition, your Row Trainer comes with an elastic band that when attached will add about 15 additional pounds of resistance so you can really dial in the proper intensity for your fitness goals. Furthermore, on traditional rowers, there is zero resistance on the return motion. In the video, I explain how the Total Gym Row Trainer produces resistance on the pull and the return motion. You’ll be recruiting more muscle and burn more calories! Instead of just doing the same old “pull from A to B and repeat a thousand times,” the Row Trainer provides a vast array of fun options. Not only will this alleviate the boredom factor, this allows you to work additional muscle groups like your biceps, core, shoulders, lower/mid and upper back muscles and of course your legs. I tell all my clients that to keep up with your exercise consistently, you’ve got to have fun. If it feels good, gives you a great workout and offers versatility, you’re going to have fun, enjoy it and keep coming back for more! It’s super quiet! Remember, the resistance is mainly your body weight as opposed to needing a big bowl of water or a fan for resistance as with traditional rowers. 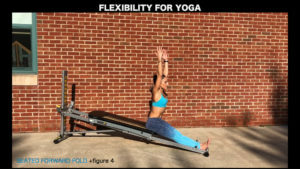 For this reason, the Row Trainer is designed to last, and it also has a 5 year warranty! There are very few moving parts that make noise or are apt to wear out. It easily folds and stands up requiring minimal storage space. Now go check out the video and then order your Total Gym Row Trainer! The New Year is just around the corner and the Total Gym Row Trainer could be just what you need to crush your 2018 and lifetime fitness goals.